Your letter could be a star! Ah, the joys of unpacking your campers! 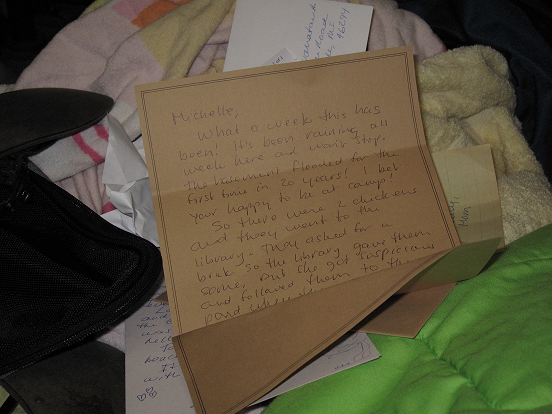 As you unpack, there’s a good chance that you just may find a few of the masterpiece letters you sent to your campers. I know you’re hoping that the pages are tattered as your camper read and re-read your funny stories. Or perhaps you’re hoping that they’re tear-stained as said camper reflected on your sage advice. Or overwritten with their notes on answering the latest SAT math question you sent. Or – and I hope this is not the case – those letters may still be sitting, crisp and unread, nestled in their original envelopes. Regardless of their state, those gems, those works of art, those clever tomes – they all have a second life! I’d like to feature YOUR LETTERS in upcoming blog posts. Please email me an image of your letter and I may feature it in an upcoming post. Interested? GREAT – please email me at letters [at] letterstocamp.net! Thanks – and happy unpacking!